Face it: Your “Han Shot First” t-shirt has seen better days. And your “Free Gaius [Baltar]” shirt hasn’t been funny since April of 2009. It’s time to upgrade your wardrobe. Luckily, Futurism Studios is here to help – and just in time for the holidays. Our new line of t-shirts are stylish, comfortable, and most importantly, funny. Each shirt features a different entry from the popular Instagram comic series, Cartoons From Tomorrow, and will make a welcome addition to any science (or science fiction) lover’s wardrobe. Created in 2017 by Futurism’s own Luke Kingma and Lou Patrick Mackay, Cartoons From Tomorrow takes a satirical – and often absurdist – look at humanity’s evolving relationship with technology. It offers a unique take on what the world of “tomorrow” might actually look like, but in a way that is still relevant, today. 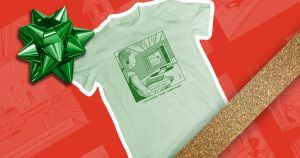 So if someone you know would benefit from an addition to their funny t-shirt rotation this holiday, check out all the shirts here.